FastReport has released the latest version of the FastReport FMX 2 component set for Delphi XE7 Firemonkey. Fast Report is a report generation component set with support for Windows and Mac OSX. 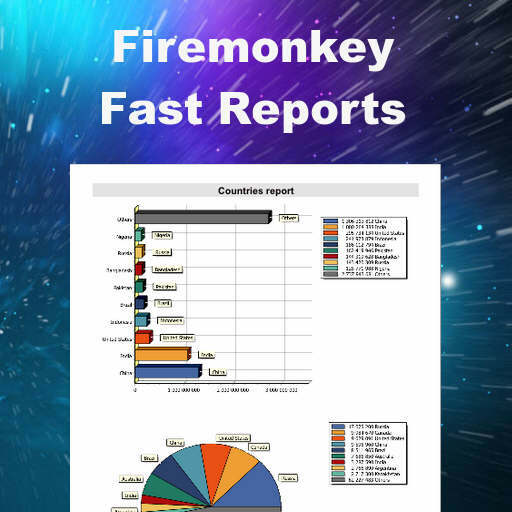 You can get report data from any database supported by Firemonkey. It comes with a full featured modern report editor and visual report designer. Additionally it comes with a report engine that includes an internal interpretation engine of these scripting languages: PascalScript, C++Script, BasicScript and JScript. Lastly you can export reports to a wide variety of document and image formats. The supported formats are: PDF (internal in Apple Mac OS X), TXT, BMP, JPEG, GIF, TIFF, PNG, HTML, ODS, ODT and CSV. This is a commercial component set but there is a free trial available. I’m not sure but I think it will also compile in the Appmethod IDE. Head over to Fast Report and check out the full list of features before downloading the trial for Delphi XE7 Firemonkey.